Embark at the base, located on the eastern side of the island in Captain Oliver's Marina at Oyster Pond. The base on St. Martin is located on the eastern side of the island at Captain Oliver's Marina at Oyster Pond, a protected lagoon surrounded by hills and the beautiful Dawn beach. It is situated directly on the border between the Dutch and French sides of the island - the hotel is French and the restaurants and marina are Dutch and the two sides co-exist peacefully! As the story goes, about 350 years ago a group of French and a group of Dutch started out at Oyster Pond - the French walking north and the Dutch walking south. Where they met on the other side of the island would determine the dividing border. The Dutch were drinking gin, while the French were drinking wine. The French covered more territory and so the French have the northern 21 square miles of the island while the Dutch have the southern 16 square miles. (Moral of the story: stick to the wine!) 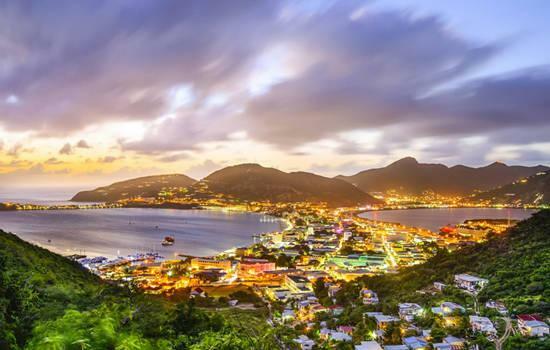 Oyster Bay is within easy reach of all the highlights of the island - Philipsburg, the Dutch capital of the island, is only 10 minutes away and Marigot, the French capital, is 25 minutes away. The restaurant at Captain Oliver's serves a seafood menu with French and Creole dishes and has a magnificent aquarium under its glass-bottomed floor so that you can admire the sharks, turtle and other sea-life while you eat. The marina is adjacent to Captain Oliver's Resort, a charming, laid-back spot that has good facilities, including a fabulous swimming pool that functions as a human aquarium, and is an excellent place from which to begin your Oyster Pond yacht charter. Good selection of lively bars, Grande Case is the gourmet capital of the Caribbean ! Sailing north from Orient Bay, as you round the top of St. Martin and start down the western coast of the island, Grand Case bay will be on your port-side, the gourmet capital of the Caribbean - Grande Case even has its own cookbook with recipes from the town's restaurants gathered together to prove the point. There are certainly plenty of eateries to choose from and a good selection of lively bars too, meaning that a late night is not out of question. In fact, it's almost required! Calmos Café usually has live music and Sydney's Peace and Love Disco can be relied up on to pump out the calypso into the early hours. The snorkeling at Creole Rock is excellent, and a fine way to clear your head after a long night on the town. Mooring: There is a pleasant anchorage for the night and dinghy dockage is available close to where the action happens. Spend your time exploring the area, both off and on the water! Drop your anchor in St Barts, you'll love the French ambiance and its elegant boutiques. Moving on from the tranquillity of Anse de Colombier, you come to the chic and sophisticated harbor of Gustavia, a long-standing favorite of the cool and trendy, who have returned annually since the 1950s for a fix of its unique Caribbean charm. In the process, they've earned Gustavia the title of "Riviera of the Caribbean". A yacht charter here gives you an opportunity to experience its delights for yourself. The harbor is snug, well-protected, and surrounded by distinctive red-roofed buildings. Hang out aboard your deck and try not to drool as you look in wonder at the mega yachts. St. Barts has a distinctly French ambience and is home to a fine coterie of elegant boutiques with clothes and jewelry by international designers, as well as hosting some interesting vintage markets. As you might anticipate, you can expect to find some 'seriously good restaurants' specializing in fine French Cuisine. There are plenty of more casual options too - take a stroll through the picturesque narrow streets of Gustavia and you are bound to find one that appeals. Mooring: Moorings are available for a fee. The anchorage is extensive and can be busy in peak season. Because the harbor bed can be weedy you need to ensure that your anchor is well dug. Dinghy dockage is available. Basse Terre definitely worth a visit. It is one of the oldest parts of the Caribbean and you'll love it's colonial history. This is an exclusive and charming private island with excellent snorkeling. Charlestown is the only settlement on Nevis, the closest island to St. Kitts. Both islands share a common landscape of mountains covered with rainforest and an abundance of tropical birds, wildlife and exotic plants. Charlestown itself has shops and restaurants, but is also an island with some historical interests and definitely a worthy itinerary stop. The history of Nevis as a French or British colony (and the squabbling that ensued) is now documented in the town's two museums - the Nelson Museum (a must for Horatio admirers) and the Museum of Nevis History. Fort Charles is worth exploring and visitors can also try horseback riding or guided hiking through the island's interior. The Four Seasons Hotel at Pinney's Beach is a great place to relax and indulge in a bit of five star luxury. The Golden Rock Estate is a beautifully restored 18th century sugar plantation that now operates as a hotel. You can take a walk through its 100-acre grounds and enjoy a traditional Caribbean meal at one of the hotel's two restaurants. Moorings: None available. Best anchorage is off Pinney's Beach where the holding is good. Dinghy dockage is available. Mooring: No moorings. The best anchor holding is close to shore. Capital of St Eustatius, Oranjestaad will charm you with its unique culture. Oranjestaad is the capital of the small island of St. Eustatius - more commonly known as Statia - in the Netherland Antilles. This is a charming town that gives a great sense of what life in the Caribbean must have been like in the past - the pace is slow, the people un-hurried and there are few tourists. Oranjestaad has plenty to interest those who like a bit of history. The town has two main sections. Along the waterfront by the harbor are buildings dating from the colonial era and the best beach on the island; together, these comprise the Lower Town. The Upper Town is home to the impeccably restored historic center and most of the island's main commercial and residential buildings. Among the historical sites of Oranjestaad are the 17th century waterfront Fort Oranje, a synagogue that is the second oldest in the western hemisphere and a Dutch reformed church dating from 1755. Amongst the most interesting buildings are the restored 18th century houses of the merchants who made their homes here. Gezaghebber House, the oldest, is the former Lieutenant Governor's residence. The St. Eustatius Historical Foundation Museum organizes a good walking tour. Snorkelers will want to explore the ruined buildings now submerged on the fringes of the harbor. There are a good few bars and restaurants in Oranjestaad catering to range of different tastes and budgets. Mooring: Moorings are available for a fee on the twelve yellow Marine Park moorings in Oranje Bay. If these are not available, anchoring is possible. In this typical Caribbean anchorage, you can stop at Ile Fourche for a spot of snorkeling and lunch. Another day, another picture perfect Caribbean anchorage. Sailing south from Anguilla down to the westernmost tip of St. Barts, stop along the way for lunch, snorkeling and diving at the cactus-covered island of Ile Fourche, home to herds of wild mountain goats. In the afternoon, sail on to the impossibly beautiful Anse de Colombier, where a horseshoe-shaped bay of shimmering turquoise water is perfect for snorkelling, swimming and sunbathing. The bay is over-looked by steep hills. Anse de Colombier is considered one of the finest anchorages in the Caribbean. Once owned by the Rockefeller family, who built a mansion on the southern side of the bay, Anse de Colombier now forms part of the St. Barts Marine Reserve. There is no road access to the bay although a trail through patches of fragrant lilies and cacti stretches from the beach up to the village of Anse de Flamandes, where there are a few small shops. Moorings: Moorings are available without charge and there is ample room to anchor. The holding is good. There is no dinghy dockage but dinghies can be beached on the sand. Prickly Pear provides a breathtaking picture postcard palm fringed beach, which offers many secluded spots. Heading north and west from St. Martin, your route will take you towards the south coast of Anguilla, situated only 13 miles (21 km) from the base at Oyster Pond. Anguilla is the most northerly of the British Leeward Islands and is surrounded by unspoiled coral reefs and mile upon mile of soft, white, powder-sand beaches. It's a gentle island that offers a warm welcome - one of the most charming and laid-back in the Caribbean. The protected marine reserve at Sandy Bay is hard to beat as a place to stop for a lazy afternoon of swimming. Snorkel the coral reefs of Prickly Pear Cays, and the waters of Little Bay teem with enough sea-life to occupy dedicated divers and snorkelers for days, if not weeks! There's so many wonderful spots, so little time .. You might just have to plan a return visit! Anchor for the night in peaceful and secluded Crocus Bay, just south of Pelican Point, where the 70 ft (21 meters) cliffs rise up dramatically above the beach. The cliffs are home to thousands of birds - including pelicans, of course! - that can be watched for hours. The snorkeling here is fantastic and the beach just cries out to beachcombers. The Valley, the main town on Anguilla, is within walking distance of Crocus Bay beach and has some interesting shops and artisan arts and crafts, as well as a few good restaurants. Koal Keel is popular with visitors. Mooring: Daytime mooring only is available at Little Bay. The anchorage at Crocus Bay has good holding. There is no dinghy dockage but dinghies can be beached. Get together for a farewell group meal with a few drinks before you fly back home.